In May 1938, Hungary passed anti-Semitic laws causing hundreds of Jewish artists to lose their jobs. 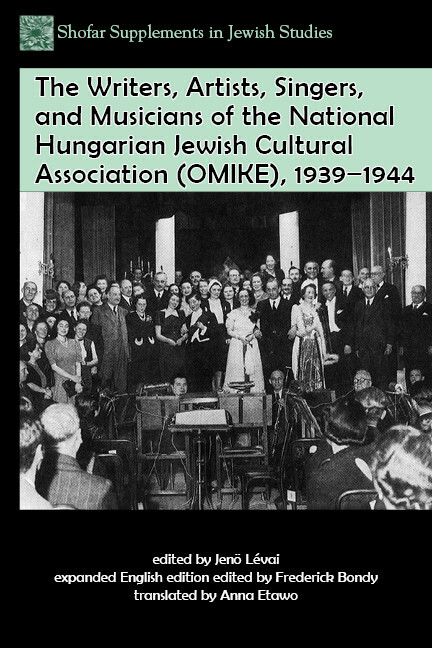 In response, Budapest’s Jewish community leaders organized an Artistic Enterprise under the aegis of OMIKE Országos Magyar Izraelita Közművelődési Egyesület (Hungarian Jewish Education Association) to provide employment and livelihood for actors, singers, musicians, conductors, composers, writers, playwrights, painters, graphic artists, and sculptors. Between 1939 and 1944, activities were centered in Goldmark Hall beside the Dohány Street Synagogue in Budapest. Hundreds of artists from all over Hungary took part in about one thousand performances, including plays, concerts, cabaret, ballet, operas, and operettas. 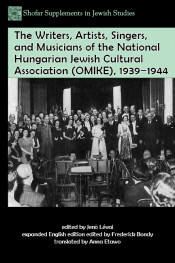 These performances appealed to the highly cultured Budapest Jewish community, ever desirous of high-caliber events, particularly under oppressive conditions of the time. Art exhibitions also were held for painters, graphic artists, and sculptors to sell their creations. Lévai’s 1943 book (with new, additional chapters by noted historians and musicians) is the core of this expanded edition and provides interviews with individual artists who recall their early lives and circumstances that led them to join the Artistic Enterprise. The book records the technical functioning, structure, and operation of this remarkable theater and concert venue. It provides fascinating details about those who worked behind the scenes: répétiteurs, hair stylists, and personnel involved with costumes, lighting, and scenery. Because the stage was small, clever choreographic and scenery improvisation had to be made, and the stagehands were clearly up to the task. Since these artists were not allowed to perform before the general public or advertise with posters on the streets, the book describes special means devised to overcome these difficulties and bring Jewish audiences into the theater in large numbers. Lastly, the book carries the theater’s story up to Sunday morning, March 19, 1944, a day of infamy, when the German army marched into Hungary. 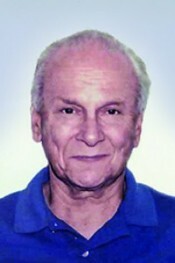 Frederick Bondy lives in New York City and was married for over forty years until losing his wife, Joan, to cancer in 2015. He has three married children and seven grandchildren, all of whom live in NYC. He graduated with a BS in chemical engineering from the City College of New York and an MS in chemical engineering from the University of Akron. He has over forty years of experience leading process engineering designs for over eighty refinery, gasification, petrochemical, specialty chemical, polymer, and pharmaceutical projects. He is the author of a number of magazine articles and encyclopedia sections related to chemical engineering. He also wrote the biography István Bondy, Hungarian Actor (1905–1944), which is in the National Széchényi Library and in the Hungarian Theatre Museum and Institute, both in Budapest. Among his interests are world history (with an emphasis on Jewish and Holocaust History), philately, and marathon running.